Our InkPro refill kits are manufactured in an ISO 9001 certified facility to ensure that our premium grade inks remain consistent for superior printing quality. 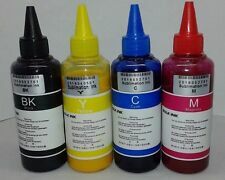 (x4) HP 61/61XL (Cyan, Magenta, Yellow, Black) 1oz ink bottles. 1 100ml Black. 1 100ml Cyan. 1 100ml Magenta. 1 100ml Yellow. 3D Printer. Qty Capacity Colour. compatible with the following printers Prusa I3 MK2S. 1 Bottle x 100ml Black Sublimation ink. 1 Bottle x 100ml Cyan Sublimation ink. 1 Bottle x 100ml Magenta Sublimation ink. 1 Bottle x 100ml Yellow Sublimation ink. Good resistant, no clog nozzle. 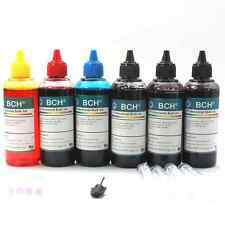 BCH Standard Grade Dye Ink. BCH inks produce a wider gamut of more vivid color, durable prints resist fading. BCH proprietary inks also prevent corrosion and clogging of the printhead—ensuring the best prints. $Document --- [Store Home] (#) --- [Description] (#des) --- [Payment] (#pay) --- [Shipping] (#pay) --- [Returns] (#pay) --- [Contact Us] (#pay) store categories --- [HP] (http://www.ebay.com/sch/ink_source_direct/m.html?_nkw=&_armrs=1&_from=&_ipg=25&_trksid=p3692) --- [Canon] (http://www.ebay.com/sch/ink_source_direct/m.html?_nkw=&_armrs=1&_from=&_ipg=25&_trksid=p3692) --- [Epson] (http://www.ebay.com/sch/ink_source_direct/m.html?_nkw=&_armrs=1&_from=&_ipg=25&_trksid=p3692) --- [Brother] (http://www.ebay.com/sch/ink_source_direct/m.html?_nkw=&_armrs=1&_from=&_ipg=25&_trksid=p3692) --- [Lexmark] (http://www.ebay.com/sch/ink_source_direct/m. Trending at $17.89eBay determines this price through a machine learned model of the product's sale prices within the last 90 days. Particulate at size in 0.2μ. So the nozzle won't clog. This is non-OEM compatible ink. Don't refill to any non-working ink jet printer. This is not a start kit, no refill instruction included. This ink is Anti-UV dye ink, which can resist against sunshine. 500ml Premium Black ink. 500ml Premium Cyan ink. Our InkPro refill kits are manufactured in an ISO 9001 certified facility to ensure that our premium grade inks remain consistent for superior printing quality. (x2) HP 61/61XL (Black, Black) 20mL ink bottles. 1 Black, 1 Cyan, 1 Magenta, 1 Yellow 240ml bottle Dye Sublimation ink. YOU SAVE OVER 95% ON INK COSTS. YELLOW 15MLS. Get this product. Compatible to: HP 60, 61, 62, 63, 64, 65, 21, 27, 54, 56, 74, 94, 98, 901, 110, 22, 28, 57, 75, 93, 95, 59, 100, 102. Most refill fails because it needs priming (to remove air bubbles). 1 Black, 1 Cyan, 1 Magenta, 1 Yellow 240ml bottle Dye Sublimation ink. Heat Transfer printing. Our InkPro refill kits are manufactured in an ISO 9001 certified facility to ensure that our premium grade inks remain consistent for superior printing quality. (x4) Canon PG-245/CL-246XL (Cyan, Magenta, Yellow, Black) 1oz ink bottles. Print image in vibrant color and crisp text. Printing performance is equal to the original. This is non-OEM compatible ink. Black 100ml ink bottle. Cyan 100ml ink bottle. Magenta 100ml ink bottle. This ink does not need ICC profiles, you only do a head cleaning with the printer toolbox and ready to print, if it is necessary to make an injector test and repeat the operation. High quality UV proof sublimation ink (Dye based) won't clog your printheads. This ink is a heat transfer/sublimation ink. 100ml(3.3oz) each bottle. One color per bottle. Our InkPro refill kits are manufactured in an ISO 9001 certified facility to ensure that our premium grade inks remain consistent for superior printing quality. (x1) HP 61/61XL Black 4oz ink bottle. Printer models will vary by market. Particulate at size in 0.2μ. So the nozzle won't clog. This is non-OEM compatible ink. This is not a start kit, no refill instruction included. Don't refill to any non-working ink jet printer. This ink is Anti-UV dye ink, which can resist against sunshine. Our InkPro refill kits are manufactured in an ISO 9001 certified facility to ensure that our premium grade inks remain consistent for superior printing quality. (x3) Canon CL-246/CL-246XL (Cyan, Magenta, Yellow) 20mL ink bottles. Our InkPro refill kits are manufactured in an ISO 9001 certified facility to ensure that our premium grade inks remain consistent for superior printing quality. (x3) HP 60 (Cyan, Magenta, Yellow) 20mL ink bottles. InkJet Stencils kit includes a 4 oz bottle of ink, one dispensing nozzle, one 8 oz bottle of Stencil-prep for transfer to the skin and two reams of tracing paper 500 sheets each. High Resolution tattoo stencils on single ply paper. Don't refill to any non-working ink jet printer. 4 x Syringes, Needles & Refill instruction. This ink is Anti-UV dye ink, which can resist against sunshine so that printings can last longer in color. For tattoo artists that work with stencils on a daily basis, this kit is a must have. The paper is A4 (8.5” x 11”) and is ideal for tattoo stencils. The paper is also the perfect pairing with Inkjet stencil ink, also included in this kit. 4 multi-color 240ml bottles Dye Sublimation Ink - Ricoh SG 3110DN 3110DNW 7100DN Virtuoso SG400 SG800 printers - Heat Transfer printing. 1 Black, 1 Cyan, 1 Magenta, 1 Yellow 240ml bottle Dye Sublimation ink. Canon HP Dell Lexmark Brother. Ink refill set for. UV Dye-based Refill ink for. 4 color inkjet printers. 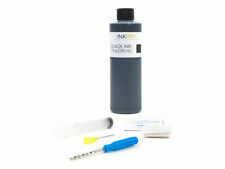 3x 100ml UV dye ink bottle for black. 1x 100ml UV dye ink bottle for cyan. 100ml ink bottle syringe,needle. You can reach to the bottom of the most 100ml ink bottle with a long needle. particulate at size in 0.2μ. So the nozzle won't clog. This ink is Anti-UV dye ink, which can resist against sunshine. Product Type Refill ink bottles. 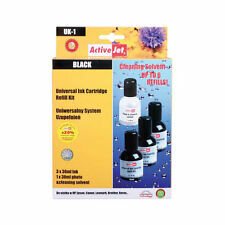 Universal Refill Ink. 2 x 100 ml Black Dye Ink. Canon Pixma MX922. Canon Pixma MX722. 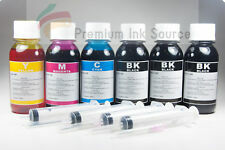 5 Bottles of Refill Dye ink (Total 500ml) for CANON Printers.  5 Ink Refill bottles.  200ml Black &100ml refill bottles per color. Ink Specifications.  Dye Based Ink. Type: Chip Resetter. The chip resetter works with on the following printers Simply align the pins and press down for several seconds to complete the reset. T061440 /T062120 /T063120 /T063220 /T063320 /T063420. 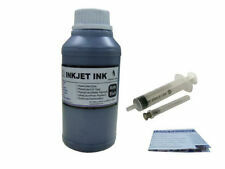 Kit includes: Two 20ml ink containers with Dye Black ink, refill. 1 X 100ml Dye Black Ink. 1 X 100ml Dye Cyan Ink. 1 X 100ml Dye Magenta Ink. 1 X 100ml Dye Yellow Ink. 1 X 100ml Dye Light Cyan Ink. 1 X 100ml Dye Light Magenta Ink. Comp atibility . 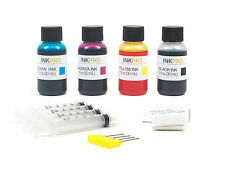 1pcs 30ml Refill Dye Ink BK. 1pcs 30ml Refill Dye Ink C. 1pcs 30ml Refill Dye Ink M. 1pcs 30ml Refill Dye Ink Y. Refill Dye ink for HP Canon Lexmark Dell Brother inkjet printer 4x30ml. • Tri Color DIY Refill Ink Kit,With good value,not harmful to the nozzle,never jam the nozzles. Easy, fast to refill ink. Included: One hold-maker machine, one power code, five top cover, 2 x 50ml bottler refill ink and instruction sheet;. Step 3: Refill ink through a new hole.;. Particulate at size in 0.2μ. So the nozzle won't clog. This is not a start kit, no refill instruction included. This is non-OEM compatible ink. Don't refill to any non-working ink jet printer. This ink is Anti-UV dye ink, which can resist against sunshine.